Unlike most racers, in which racing runs in the family, Ian’s parents were very much against motorcycling. They tried to resist Ian getting a motorbike, so got him a trials bike instead. However, as soon as he could, at the age of 17, he passed his motorbike test and never looked back. It was at 17 that Ian attended his first TT, as a spectator. He didn’t know too much about the race and has been quoted saying he didn’t really have any thoughts about competing. Come 2003 however, and inspired by his hero and fellow Yorkshireman David Jefferies, a nine-times TT winner, Hutchinson entered the Manx Grand Prix Senior Newcomers race, an event he duly won. The achievement was made even more impressive as Ian was riding on a 600cc Honda against 750cc Suzuki’s and he also recorded, at the time, the fastest ever lap recorded by a circuit debutante. His first TT appearance came a year later in 2004, in which he came 10th in the Formula One race and 12th in both the Production 1000 and the Junior 600cc races. In 2005, he took three top ten finishes, increasing his fastest lap to 122.90mph but it was 2006 that would prove to be his breakthrough year when he joined McAdoo Kawasaki. 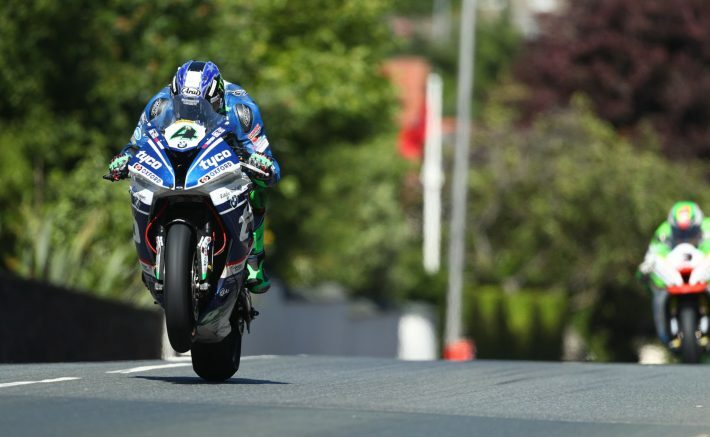 It was a successful partnership from the start and, after winning the Supersport race at the North West 200, Hutchy finished second in the Superstock race at the TT and third in the Superbike, lapping in excess of 126mph in the latter. Ian’s racing hero as soon as he got interested in the sport was fellow Yorkshireman David Jefferies who won nine TT races between 1999 and 2002, also setting a new outright lap record in each of those years. Jefferies was Hutchinson’s main inspiration for competing at the Manx GP although Jefferies death at the 2003 Isle of Man TT races meant it almost didn’t happen. After such a successful 2006 season, Ian was snapped up by HM Plant Honda for 2007 and he repaid the faith shown in him by finishing on the podium in all four of his races, including a maiden win in the Supersport race when he beat top competitors such as John McGuiness and Guy Martin. He backed this up with third in the Superbike, Superstock and Senior races, his best lap speed now in excess of 128 mph. Since that first win, Hutchinson has won 15 more TT races, taking him to 4th place in the all-time leader board. Only Dave Molyneux (17), John McGuinness (23) and Joey Dunlop (26) have won more TT’s than Hutchy (16). Five of those wins came in 2010 when he became the first and only rider to win five races in a week, sweeping all before him with victory in the Superbike, Supersport 1, Superstock TT, Supersport 2 and Senior TT races. This broke Phillip McCallen’s record of four race wins in a week in 1996. Ian’s achievement can be seen in the hit documentary TT3D: Closer to the Edge, which follows the racer journey’s before, during and after the 2010 TT races. Not long after his record-breaking feats of 2010, Ian suffered a crash in a British Supersport Championship race at Silverstone suffering a badly broken leg which nearly resulted in amputation. He endured over 30 operation and it cost him three years of his career but he bounced back at the end of 2013 to take a stunning win at the Macau Grand Prix. The 2014 TT was disappointing but in both 2015 and 2016 he took a hat-trick of wins and finished on the podium in all of his other races and due to his determination, success and professionalism shown in winning the TT, Ian was awarded the Torrens Trophy in 2015, becoming only the ninth winner of the award. 2017 saw him add two more TT wins and his tally now reads 16 wins and 27 podiums whilst he’s also the second fastest rider of all time with a lap of 133.115mph. However, he’s now on the comeback trail once more after re-breaking his leg in a high speed crash during the Senior TT. As well as the TT, Ian has had success at the North West 200 and Ulster Grand Prix with three wins and nine wins at the two events respectively, the latter the joint sixth highest of all time. He also held the outright lap record at the Ulster in 2016 before Dean Harrison set a new mark in 2017. Having joined Honda racing for 2018, Hutchinson made his return to racing at the North West 200, after breaking his leg at the TT in 2017. For a long time it looked as though Hutchy would have to sit out the famous race, though remarkably he was out testing the Honda Racing Fireblade a few days after the external fixator cage was removed from his leg in late April. Despite the injury, Hutchinson managed 7th place in the Supersport race, where he was riding the 600cc Padgetts Honda,, 11th in the Superbike and 12th and 13thin the Superstock encounters. It was an achievement in itself that Ian was competing in the TT so quickly after having the external fixator removed and although he wasn’t running at the top end of the leaderboard, he completed 39 laps of the Mountain Course on the CBR during practice and race week. Riding the Padgetts Honda once more, Hutchy finished 16th and 11th in the Supersport 1 and 2 races respectively with a best lap of 124.453mph. Although he retired from all three 1000cc races on the Honda Racing machines, Hutchinson and his team were happy with his performances and, after lapping in excess of 127mph, it was very much a case of ‘mission accomplished’. TT2018 was all about getting track time for Hutchinson and laps under his belt on the Honda Fireblade, which he more than achieved, and, as expected, he didn’t race again during the season, instead preferring to focus on his fitness. This he duly did and was back out testing in October and November in preparation for 2019 and we’re sure he’ll get back to full speed very soon.